Did Someone say Special Forces? We’ve been tinkering once again and have decided to come up with another custom build to keep our C8’s company! 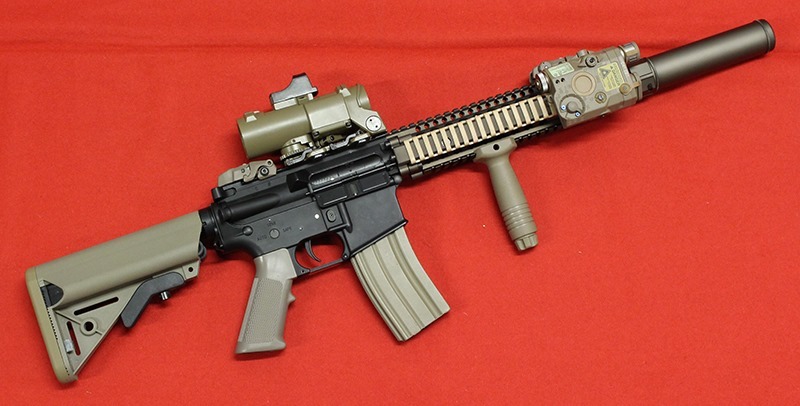 This time we’ve gone for the MK18 MOD 1 rifle! 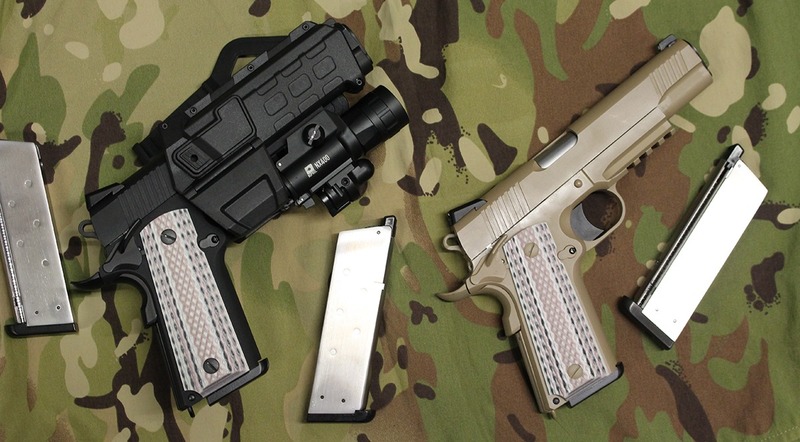 commonly seen in the hands of US Special forces such as the Navy SEALS! 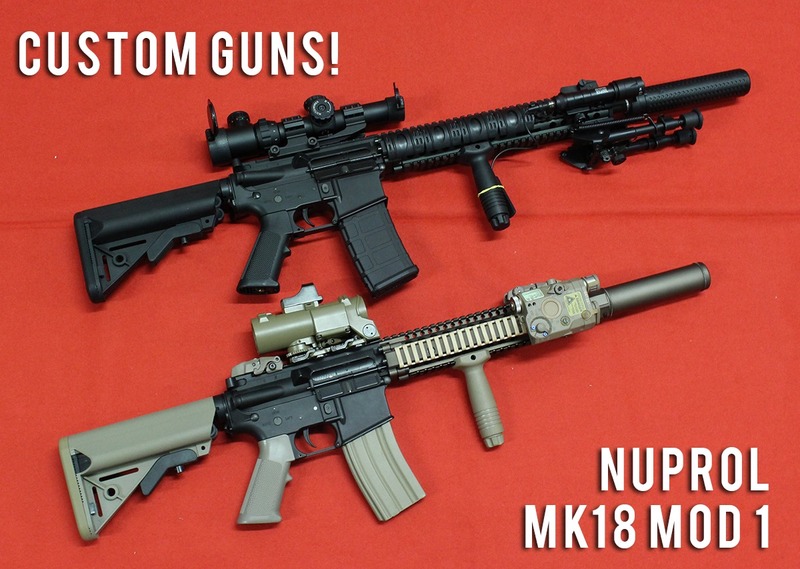 A nice addition to any special forces inspired kit, The MK18 weapon system provides a highly modular platform which can be adapted to suit a number of different play styles! Once again we set out to build a good looking (NOT 100% USED BY THE SEALS ACCURATE) rifle, once again turning to the brilliant line of Nuprol Guns and accessories to help us achieve this. The base gun (Now we could have just used a Nuprol Enforcer Bravo however with the idea of building on a budget we selected a slightly cheaper rifle: the Nuprol Recon Bravo. Removing its existing Keymod rail we replaced it with a Bocca 9.5" Rail system in Tan/Bronze alongside swapping out the pistol grip and crane stock for tan ones. Although it can come in standard black, we felt like the iconic two tone Black and Tan/Bronze would really suit this build. Accessories wise we added a few extra bits to set the rifle up just right: Up top, we used a Nuprol 4x Phantom optic with doctor sight to suit both mid range and close rangeengagements, and for those who don’t quite like the Phantom we’ve also included some flip up iron sights. Up front we put the rail system to good use, adding some rubber ladder style rail covers to provide comfort alongside a standard vertical grip. We also included a Nuprol NPEQ15 up top to provide a light and laser. To finish off our MK18 we’ve added a Nuprol BOA Suppressor up front to match the gorgeous bronze rail system. As cool as the standard MK18 Is, we felt like it needed a bigger brother, much like the C8 we decided to also mock up a longer variant for those of you who prefer some long range engagements! For this one we kept things far simpler, using the Nuprol Delta Enforcer Alpha as the base gun. Even though the Nuprol Enforcer range does cost slightly more, it does come already equipped with a MK18-esque rail system so most of the work is done! We decided to kit our longer MK18 out with our own spin this time, using a Nuprol Optics ZR10Short dot scope up top. The ZR10 allows the user to progress from 1.25x magnification all the way up to 5x depending on how far the target may be. To aid long distance shots a Nuprol Multi-Pod sits underneath. If you feel like you’d rather storm a building then we’ve also equipped it with a NX600 weapon Torch to help navigate those dark areas. Finally up front we once again sealed the Spec Ops look with a Rechargeable Tracer Unit from UFC. 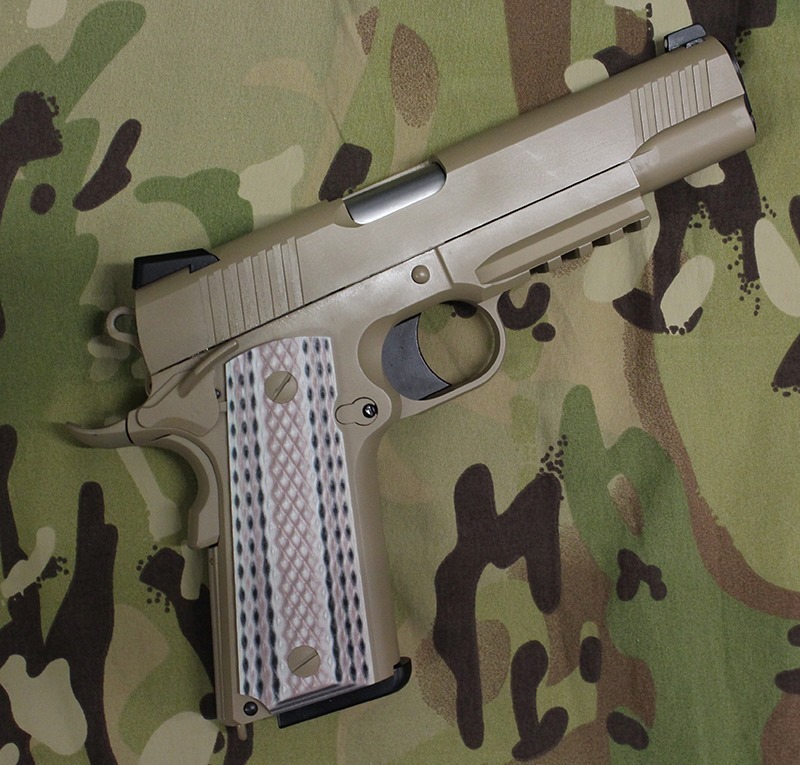 In store we currently stock the New WE M45a1 GBB Pistol in both black and tan. 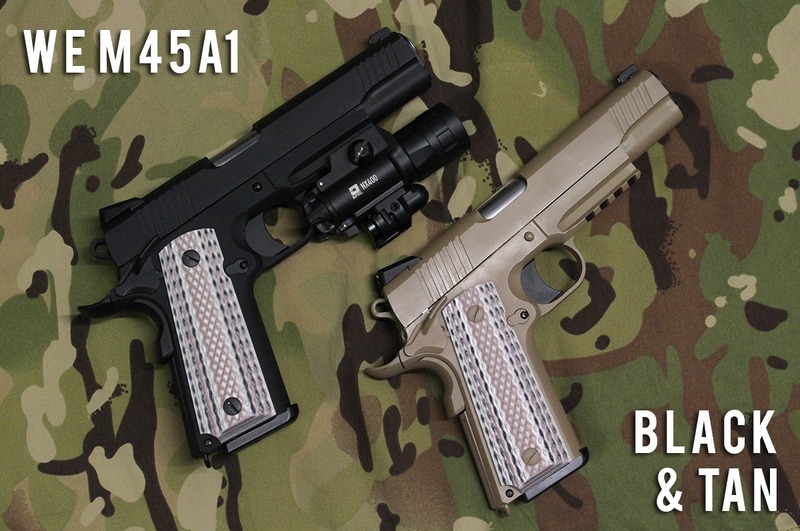 These models feature the iconic fire controls and functions as the standard 1911 platform, making it both simple and easy to use! Featuring enhanced grips and slide serrations which provide better grip surfaces for the user whilst handling and racking the pistol. The Beaver tail safety has also been enhanced, with a contour better suited to the users hand. 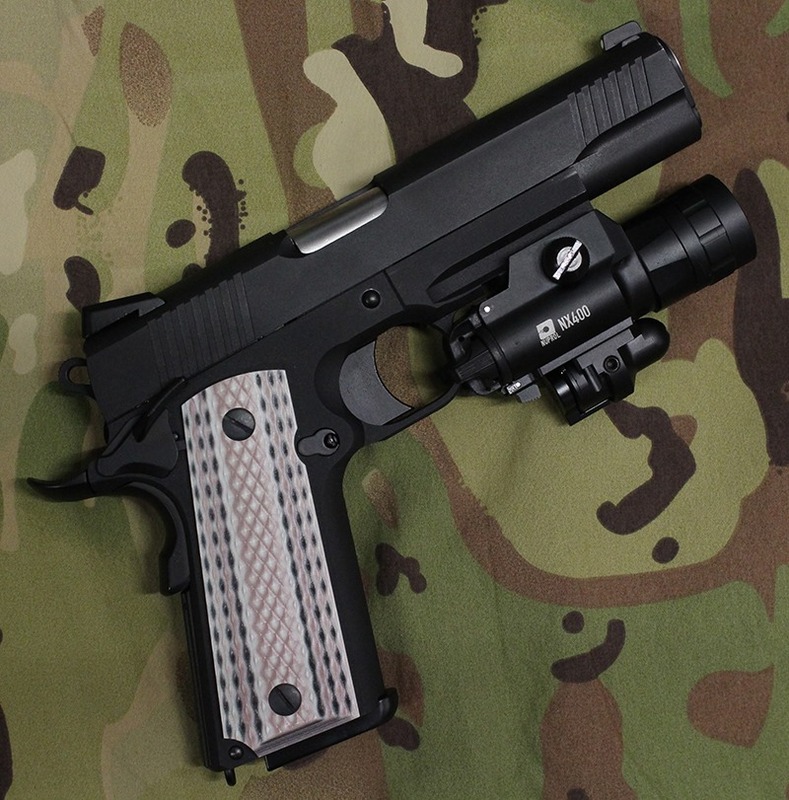 This keeps the users grip high and tight into the pistols back strap aiding overall control of the weapon. The iron sights are far more pronounced to allow easier target acquisition over traditional style sights. To keep things tactical the M45A1 also features a Rail mounted on the underside to allow the user to attach torches/lasers if necessary. Alongside these pistols we also carry all the necessary accessories such as Nuprol NX series Pistol torches, Spare MEU Style gas magazines and even holsters from CCCP which allow the user to carry the pistol with a weapon light attached! So if you feel like its time to get your Special Forces Loadout together? Check out these fantastic products and many more over on our website www.a2supplies.co.uk or visit us in store!